This blog post was originally published on The Huffington Post. It has also been posted on Moms Rising. Progressives have always had mixed emotions about breastfeeding. 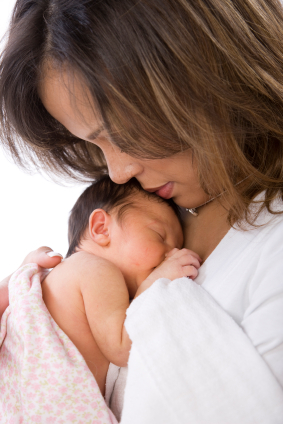 We support a healthy diet and natural living, and breastfeeding is as natural as it gets. We also have a low tolerance for chemical additives, including those found in infant formula. On the other hand, breastfeeding has been used to oppress women. Feminists recognized this in the 1960s, and labeled infant formula “liberation in a can.” With formula, daddy could get up in the middle of the night for feedings and mom could get some sleep, and the infant could be fed while in child care during the day, so mom could work for pay. Since then, moms have gone to work in record numbers (see Figure 4), while the U.S. government and advocacy groups have gone on a mission to promote breastfeeding. The movements have clashed and, so far, work seems to have won: we have yet to reach the modest Healthy Families 2010 target of 50 percent of mothers breastfeeding until an infant is at least six months of age. Some folks actually revel in the clash, hoping to reverse women’s economic gains by sending the message that good mothers opt out of employment (as documented by Pamela Stone). Breastfeeding promotion provides a powerful tool in these efforts. Of course, when this crowd wins, women become more financially dependent on men: Stephen Rose and Heidi Hartmann found that women’s hourly wages drop 22 percent for even one year out of employment, and drop even more steeply for more time out (see Table 2). In 1998, Representative Carolyn Maloney (D-NY) recognized that this clash was artificial and needless (and arguably less than humane). She began introducing legislation to make work consistent with breastfeeding, and she has introduced the legislation continuously since then. Finally, in 2010, a relevant provision was included in the Affordable Care Act. Basically, the legislation guarantees employed moms paid on an hourly basis reasonable breaks and a sanitary, private location to express and store breast milk for an infant under the age of one year. A new report from IWPR (which I co-authored with Jeffrey Hayes and Youngmin Yi), released today, shows who is covered by the law and estimated effects. It turns out that almost 19 million employed women of childbearing age are now covered by the law. Better yet, because it covers hourly (as opposed to salaried) workers, it will help moms with the rigid jobs that have made breastfeeding so difficult in the past (think low-wage, women of color, low levels of education, and young women). And the bottom line? Over 165,000 new mothers will breastfeed their infants through at least six months, and we will come closer to meeting the Healthy People 2010 goal as a result. But hold on to your hat because there is another bonus: once mom is expressing and storing milk, dad can get up in the middle of the night and feed the baby. Does it get any better than that? Dr. Robert Drago, Ph.D., is Research Director with the Institute for Women’s Policy Research. Prior to joining IWPR, Dr. Drago held positions as Senior Economist in the Joint Economic Committee of Congress and Professor at the Pennsylvania State University in the departments of Women’s Studies and Labor Studies. He has published multiple articles and books, including his latest books Unlevel Playing Fields: Understanding Wage Inequality and Discrimination (3rd Edition) and Striking a Balance: Work, Family, Life.